Its coming up to the busy New Year time again 2019 is round the corner. And the usual resolution is to get into shape, and we mean it this year don’t we? 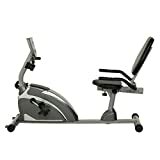 We have five great choices for under $200 Exercise Bikes, they fall into two groups: Recumbent and Upright. Recumbent bikes are great if you find upright bikes a little to uncomfortable, or if you have health issues. They do take up a bit more space and can cost slighly more than their upright equivielent. The differences are explained in my guide here. 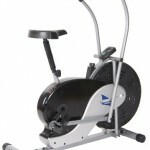 At $180 including free shipping this bike has all the features you need to get fit and lose weight. With a builtin pulse meter you can ensure that you fitness goals are being met. An upgraded version of the basic model, the 400XL features a higher weight capacity, and more workout levels. With 8 levels of resistance you are sure to find the right level for you. We love the wide comfortable seat, perfect for a daily workout! The frame is beefed up making the whole bike feel solid and stable even during hard exercise, giving you the reassurance to push yourself. If $180 is a bit much at the moment, how about the Body Rider Fan Bike. 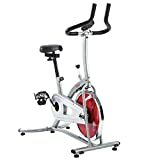 At just $80 this is probably the cheapest exercise bike on the market. Don't let that put you off, the bike features moving arms to increase the workout effectiveness. As the resistance comes from the fan it keeps you cool while you exercise. This makes the bike simple and effective to use for your daily exercise. 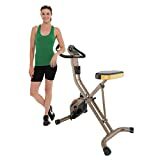 With its fixed wheel, digital computer and max rider weight of 220lbs, the Sunny health and fitness Indoor bike offers far more of a challenging workout than the other bike features. The resistance comes from a felt pad that presses against the flywheel. This is a far more intense workout than the magnetic resistance systems, common at this price. 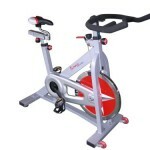 For a great value workout the Sunny Indoor Cycling Bike is our choice! If you prefer a more laid back approach to your exercise then a recumbent might be a better option. As you are lying back there is less pressure on your back and you joints. So there you have it, 5 affordable exercise bikes that will save you hundreds in gym costs. Add in the time saved travelling and you could have your workout done in the home before you have even driven to the gym!. With prices starting at less than $100 you have nothing to lose, except your weight! 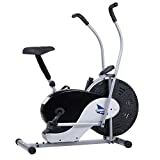 Make your 2019 New Year resolutions stick with one of the best exercise bikes for under $200.